Famed Scottish yacht designer William Fife built Moonbeam III for a British regatta in 1903. Scottish designed and built Moonbeam III is a work of the yacht designer William Fife III, part of a line of Fifes who earned fame during the golden age of sailing by building two America’s Cup challengers for English tea mogul Sir Thomas Lipton. The Fifes made a reputation for themselves by designing yachts that were both beautiful and speedy at the William Fife and Sons shipyard in North Ayrshire on the Firth of Clyde in Scotland. 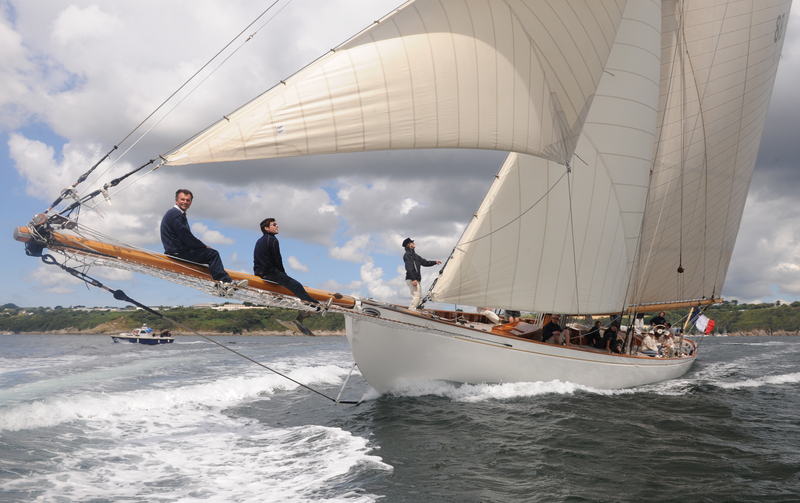 Designed and launched in April 1903, Moonbeam III was ordered by the London lawyer, Charles Plumptre Johnson, a member of the Royal Yacht Squadron and the Royal Thames Yacht Club, to take part in regatta on the east coast of England. In fact, the yacht has won at least two races in its more than 100 years sailing. In the Mediterranean’s Course Croisière Méditerranée race, it took first place in both 1927 and 1928, under the name Elbis. Moonbeam III has also passed through the hands of notable owners over the years. In the early 20th century it was acquired by Félix Amiot, an aviation pioneer, who stored it on dry land in Cherbourg for 24 years. It’s been restored a few times as well. In 1970, it was sent to Southampton on the other side of the channel for a restoration project that took ten years, and was carried out at the Camper & Nicholson yard. More recently, the yacht underwent a full restoration in 2006 in France. The yacht has often homeported in Saint-Tropez, on the French Riviera and has participated in many major events for classic yachts such as an event in Cowes in 2001 for the Jubilee of the America’s Cup and Fairlie in Scotland for the Fife Regatta in 2008. The Fifes launched four Moonbeam models between 1858 and 1920, but Moonbeam III was the first in a series of fast yawls designed by the firm that fell in line with the Royal Ocean Racing Club (RORC) measurements revised in 1900, and came when William Fife III — the family’s most celebrated designer — was at the height of his skills. Moonbeam III is built with teak planking on an elm frame. Initially designed with a yawl rig (2 masts), the yacht now has a gaff cutter rig. The yacht is being auctioned at Retromobile, the Parisian classic car show that features both strange and stunning exhibits from across the motoring world. If you’re inclined to bid, bring a hefty bank account balance, as Auctioneer group Artcurial expects the yacht to fetch 1.5 million euros. See a gallery of photos below. Scottish designed and built Moonbeam III is a work of the yacht designer William Fife III. Designed and launched in April 1903, Moonbeam III was ordered by the London lawyer, Charles Plumptre Johnson. The yacht has often homeported in Saint-Tropez, on the French Riviera and has participated in many major events for classic yachts. The yacht has won at least two races in its more than 100 years sailing. The yacht underwent a full restoration in 2006 in France. 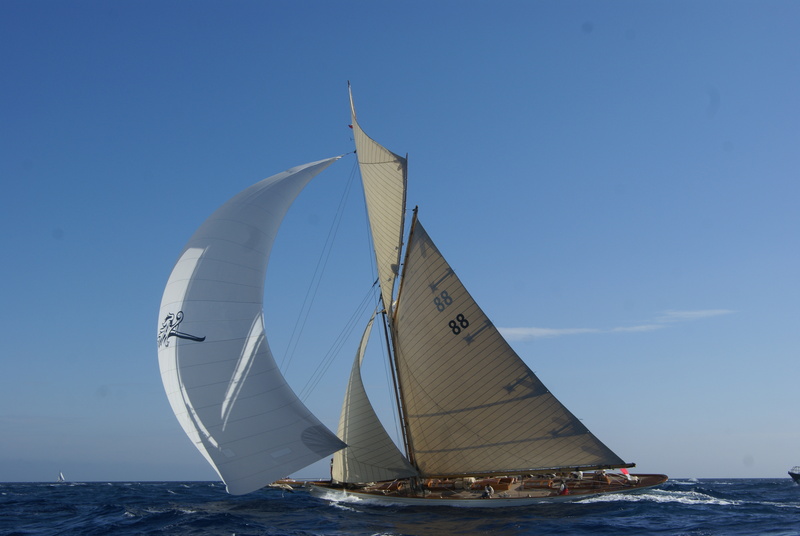 Auctioneer group Artcurial expects the wooden yacht to fetch 1.5 million euros.